Why Some Stations Have Missing Data – To view data that is less than 30 days old, you must register or login. Unfortunately, we don’t have physical access to the weather stations. 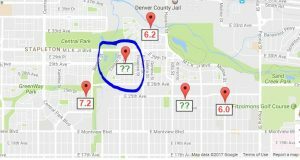 Many of the weather stations that you see on my website are from an awesome volunteer organization called CoCoRaHS (http://www.cocorahs.org/). Because many of these stations are located in the backyards of residential homes, the operators of the weather stations may not always be around to post a weather report. Maybe they are out of town, maybe they are busy, and maybe they had a late night and don’t feel like checking the weather station early the next morning. Can you blame them? EXAMPLE: I need 3 days of snowfall but the weather station near my address has all missing data. What do I do? Email me at pcarpenter@theweathercollector.com for some suggestions.